This article and all the pictures in it has been contributed by Mike Grove, one of my blog readers. 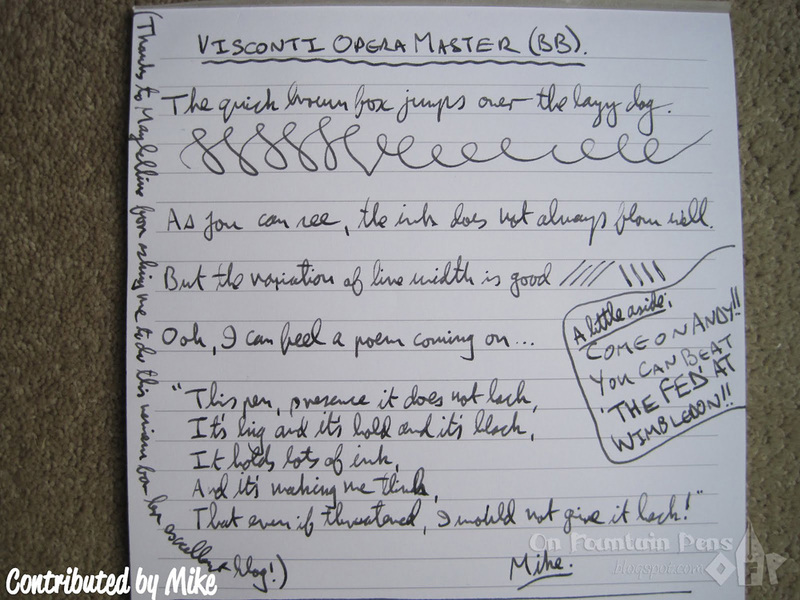 Thank you Mike, for being so nice as to share about your pen on my humble little blog! 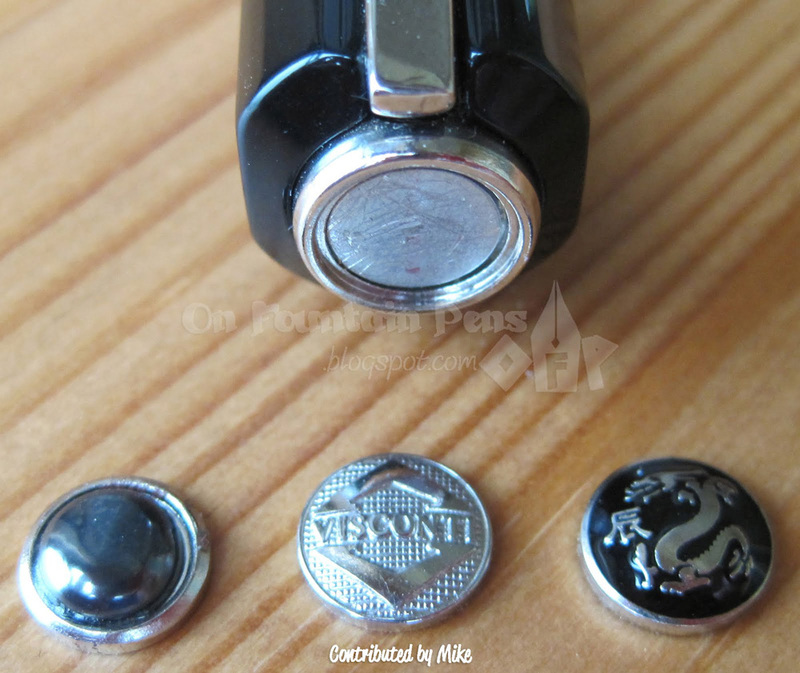 Hopefully this review will help out those who are looking for a nice Visconti pen! I ordered it with a Double-Broad nib (BB), because I like wide nibs – they help make me write larger and therefore more legibly. The nib is 23 carat gold, plated with Palladium. The pen is referred to as ‘over-size’, which means that it’s about 6″ long when capped, 7.5″ with the cap removed and stuck on the end of the barrel. 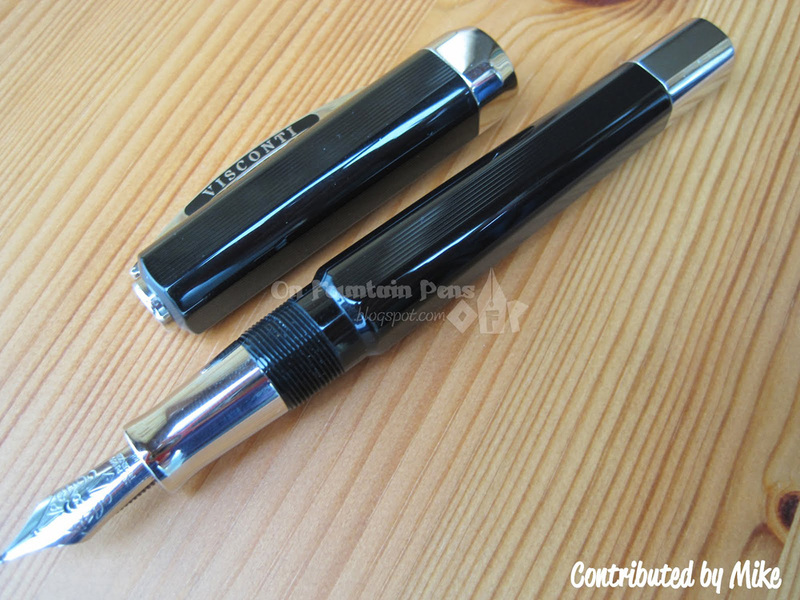 And it features the Visconti ‘My Pen’ system. But all that means is that the top of the cap is magnetic and you can buy replacement metal discs which stay put when you place them on the magnetic area. 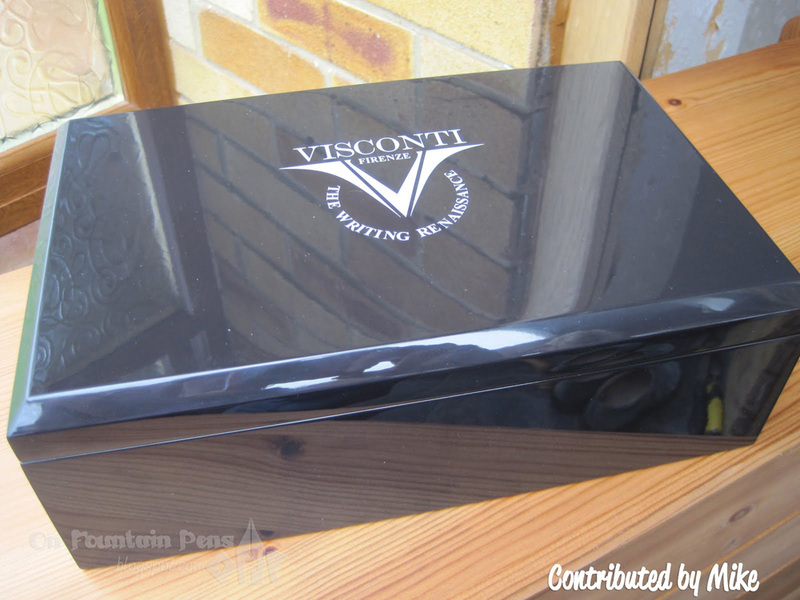 The following picture shows what I mean (you can see the original Visconti logo cap, plus the two I bought – a Jet Black cap, and a nice Dragon design cap which is my favourite). and inside that, next to the pen, was a beautiful lead crystal inkwell! 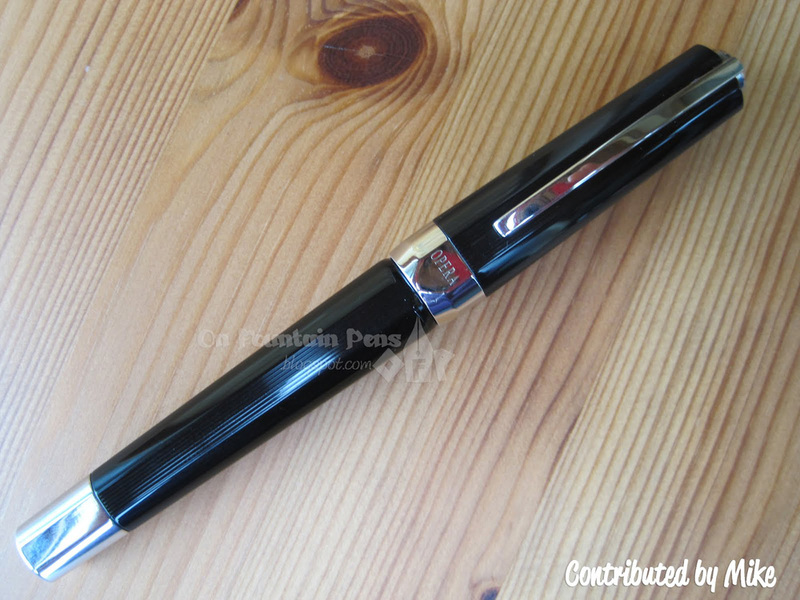 So finally, I reckon that if this pen was a gun it would be a Clint Eastwood style 45 Magnum, or if it was a car, it would be a stretched Cadillac with smoked glass and a chauffeur who would just as soon pull your arms off as talk to you. So it’s a big, brash, in-your-face kind of pen, and I love it! In fact, although I’ve never given any of my pens a name before, I have just decided to christen it “Dirty Harry”! You're welcome! 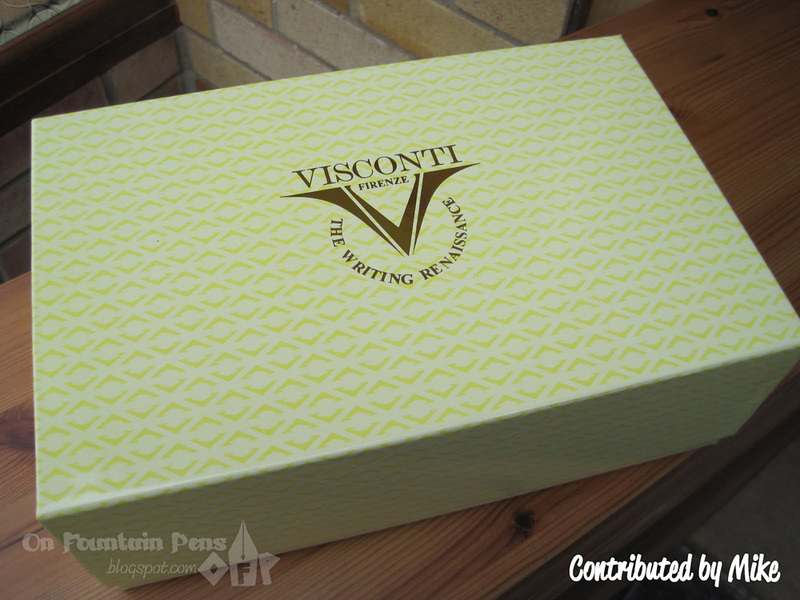 Hope you find a nice Visconti that suits your needs. thanks for the review Mike! and thanks to maybelline for featuring it. I didn't know about the 'my pen system'. looks really interesting. This Visconti may be too large for my own taste but it's making me look forward to finding one I like!